john4jack (Corvallis, Oregon, United States) on 7 November 2009 in Architecture and Portfolio. Spotlight and vfxy - I generally don't pay too much attention to Spotlight or vfxy, but recently I've taken a look. Some of the photographs are extraordinary (such as Mariana's "gray hair" on vfxy's Buzz), but, my goodness, there is a lot of mediocre stuff. How the decisions are made mystifies me. I have appeared on both but I certainly don't think that it has been my best work that has been selected. Wonderful tones and light and I like the processing on this! I'm not so sure on your comment about your best work in the spotlight photos - I remember the one you took with the branch and I think it had white flowers and/or a touch of red - that was fantastic and it made the spotlight - one of my favorites! @Didier DE ZAN: Merci. I could easily obsess on old barns. I love the brown monotone and white vignette; it has so much charm and interest !!! Beautiful!! I like this - B&W was a good choice. Great processing. Like irreal ,beautiful in b&w! @k@: Merci, Karine. I am 100% with you; it is the sharing that is important. Always this incredible feeling, see the past in front of my eyes and this memorable american landscape... The wild. The Huge. Wether in B&W or in Color. Memorable indeed. Jack this is superb! Your post production reminds me of an old postcard. Beautiful image. @bluechameleon: Thanks, Sharon. I am still basking in the beauty of your photograph yesterday. I expect that you will be teaching your grandchildren of this type of natural beauty. If you don't get them out into the 'wilds' you'll at least have your photos to show them. This is a wonderful old barn! @Judy: Our kids spent their childhoods experiencing wilderness. Our boys fondest memories are of those backcountry trips. And Brock and Karen have had our granddaughters almost from birth hiking and camping in areas of great natural beauty; Fiona has her own tent. A fine image to begin with... made better with you processing and presentation. What a great image! I've been on VFXY for some time and more and more it seems pointless. I've sent several emails requesting to quit (as directed by their info) but have never heard from anyone. Strange to say the least. @don: Thanks, Don. As Karine said, it is the sharing that really matters. 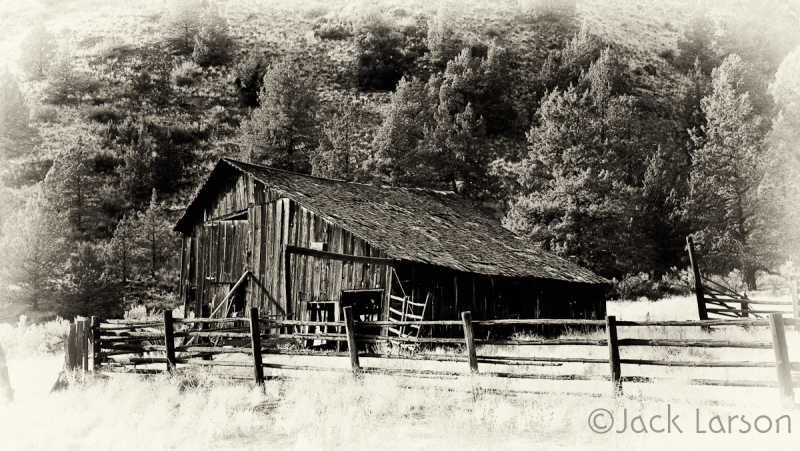 A wonderful old barn..beautifully shot..a processing just perfect for the scene. wonderful monochrome picture. It is elegant. Awesome old barn! I love the way you've processed this to show off all the great textures! A B&W feast for the eyes! @Ken: Thanks, Ken. Your "Uptown Bikes" is a cool shot. I wish that you were on Am3. Un petit quelque chose de "La petite maison dans la prairie"
@Macrobaby: Thank you. I sent a separate email on LR 2. I like LR 3 beta even better. To re-iterate the email, set up the Library module to fit your own specific needs, and devote your major energy to learning the Develop module (it is very user friendly). @Marion: That whole part of Oregon is a blast from the past. @Susan: Thanks, Susan. Silver Efex Pro. This is a wonderful photograph (with or without the effect) Jack! a nice vignetting that gives a timeless at your shot , jack! Beautiful black and white. Have a good day. Antoine. I love the barn and the fence all in wood. Wow, great processing on this shot, Jack! Comnposition etc is all very well but I truly love the processing here - it´s most adequate! Love this....seems as though there should be a mule in the image somewhere!! @Twinklestamper: All looks to have been long ago abandoned. what a treaure to find! Love the way it fits in under the hills! @Anastasiya: Thank you; I agree on the find. I like the tonality, the presentation and the general effect of old times! @JOEMULLIGAN: Thanks, Joe. I love old barns. Love you use of vignetting on this image--it is so appropriate to the subject. Love the B&W.